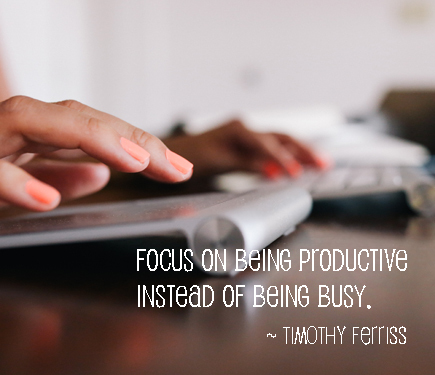 Personal productivity is all about managing your daily activities. In my sales workshops I ask participants to list the six most important ACTIVITIES they do every day that help them to be successful. I’ve never once seen “review my email messages and surf the internet” on that list. Yet when I ask which activities consume most of their time, those two are often near the top. I’ve learned over the past 30 years that very few salespeople can identify the six most important daily activities that help them succeed in selling. Even individuals who are members of the same sales team will have different lists. You would think that if their job responsibilities are the same, their lists should be nearly identical. Usually they are not. More complicated? Maybe; but certainly not more difficult. If you can’t separate the wheat from the chaff in terms of your activities, you risk becoming so discombobulated that you don’t know what to do when you start your workday! Plan my day – write a to-do list, prioritize that list according to my goals, and complete them in order of priority. Contact one of my top 20 customers/prospects and advance the sales process. Research and add four new qualified prospects to my database. Initiate and set three face-to-face or telephone appointments with qualified prospects. Conduct two sales appointments to advance the sale. Read material that enhances my ability to serve my customers better than anyone else and add value to their lives. All other activities should support those six. I’ll do #2, 4 and 5 when customers are available. The others happen outside prime time. Your numbers will be unique to you. But whether you use SalesForce.com or file-cards, the library or the internet, emails, LinkedIn or phone calls, a planning app or a piece of paper, remember they are just tools to help you do your job. Your job is to get people to buy what you sell. How you get there is up to you. What counts is that you are effective and efficient at connecting with people and advancing the sales process. If you haven’t figured out what activities do that for you, you can’t be productive.